Looks like Graham downloaded the specs, or more than likely, went down the hall at 567 W. Lake to get them. These cars are said to be able to couple with 2600-Series, 3200-Series and 5000-Series railcars, but will only be able to trainline and operate in a train consist with 5000-Series railcars. How can these A/C-powered 7000-Series be expected to couple with the 2600-Series and 3200-Series railcars, both of which are D/C-powered? You can't run them together because you'd have operable cars and dead cars with no power. They are incompatible. What's the point of the 7000's being able to couple with the 2600's and 3200's? Anyone on the forum able to shed some light on this??? Mechanically, not electrically. You can shove them if one set breaks down. Same thing as a 6000 with any series starting with 2000. Graham is just repeating old CTA lingo. Looks like the 7000-Series seating arraignments will mirror the 3200-Series more than the 5000-Series. I always wondered why they didn't use more elements of the 3200s. That's a nice combo of front facing seating (including singles) and plenty of standing room including in the middle of the car. The annoying thing about 2600/2400s is that in the middle of the car you can only hold on to seat backs, not a pole or strap. I'm surprised that they came out and said that this early. However, you are still getting the 17.5" scoop seats, instead of the 18.5" Aries seats or the like. Also, another implied backhanded slap at the Kruesi administration in the article, which, of course, it deserves. What they need to do is change the seats around in the rest of the #5000's to be delivered. If they can change interior colors, they can do that. With regards to the color scheme, I'm not sure which side of the fence you're referring to here... do you mean all 5000's should have interiors like 5000-5268 or like 5269-Present? Being a fan of the blue myself, I like it... it's not overpowering on the eyes. It's noticeable, but I think it's a welcome difference. I think you're out of luck on the seating arrangements on the 5000's. If they change the seating in the future cars coming in, they'll have to do a retro-fit on the older cars, otherwise the public will be complaining about their layout. Also, that means Bombardier will have to stop production and take whatever cars are built in Plattsburgh right now and rearrange the seats to a new layout, which will delay their arrival and acceptance to the CTA. I like the original interior, but the point is, is they can do a change order to change cars to have color LED signs or change interiors this should be done as well. They don't have 700 cars yet of longitudinal seat trains. Once they receive cars with longitudinal seats, the riders will most likely have to put up with those for the next 40 years. Remember when the #1000's were delivered, they reported they would change those seats in the first 300 to reflect the rest of the fleet. I'm still waiting for that change and I'm not holding my breath on whether those will come out of rehab with changed seats. As discussed many times earlier, the excuse they give is that somehow that would affect the car structure. However, some have doubted that, especially since the addendum for the 7000 series says to use cantilevered seats. And you believe that? Then how did they ever get away with running the max capacity cars on the Brown line without a complete structure change, or the #3407 longitudinal prototype without a structure change? They can change the cars seating, they just don't want to. I don't know if I believe it or not. The only point is that it is as definitive as anything to come out of the corporate mouth of Claypool, and I took it as "whatever you folks say, the seats are going to be like that." Thus, I find it hard to believe that (1) they would continue with 500 more like this, but then (2) said that the next 850 or so won't be. And, as far as the max cars, there was a certain limit to that, in that they said that taking out all the seats would exceed the GVWR, so they only took out some. For what it's worth, I heard information regarding the permanence of the seating layout long before Claypool told this to the Tribune. Supposedly, an engineering change authorized during the Huberman era essentially cemented the longitudinal layout. I'm sure that if there's a will there's a way, but as with any engineering project changes that may seem "easy" aren't always so. I think the 7000-series rail cars might have additional seats! This makes the most sense, and matches what I figured earlier. 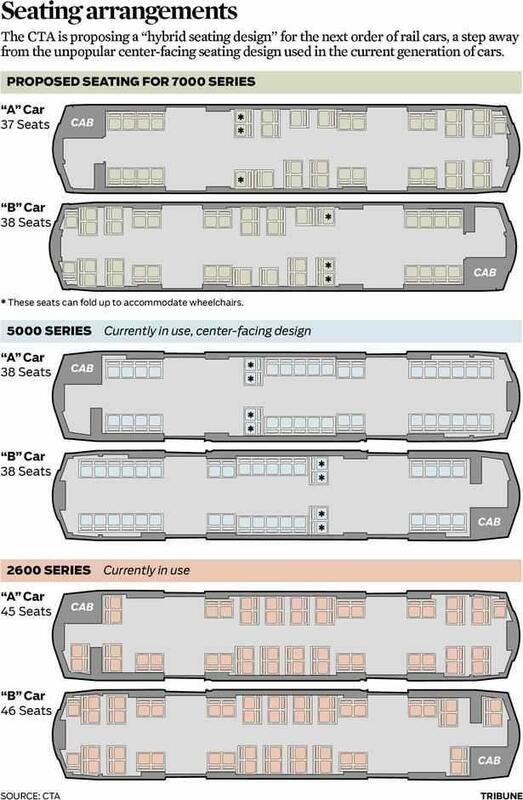 It's not that changing seating layout, per se, requires some major structural modification. It's that once they decided to go with the longitudinal seating in the 5000s, they made specific design decisions around it (such as putting stuff on the floor underneath the seats) that would require significant redesign to change. That kind of a redesign would not be cheap as a change-order for the 5000 series, but since the 7000s are going to be a different fleet, with a different contract, they can make those kinds of changes. From what was indicated, 37 in the A car, 38 in the B*, which would be less than the 39 in 3200s. Supposedly the 5000s had the same number of seats as the 3200s. The big difference in the published 7000s arrangement is that there are two wheelchair positions inboard of the front doors rather than placing the wheelchair against the cab wall. The question then becomes whether that is made up by the 4 longitudinal seats between the door and the cab on each side. * B car gets one more seat because the place for the plank is in the A car. "The upcoming model will replace the current cars on the Pink(all 5000's), Red(2400's, 2600's and eventually all 5000's) and Green(all 5000's) lines, some that have been in use for the past 30 years. The new cars are said to reduce delays, mechanical dysfunctions and save on operating costs." Did I wake up and it's 2039 today??? Are the 5000's really the NABI equivalent of "L" cars and needing to be retired before we get all of the order even in??? Or is this just journalism at it's finest??? ...Or is this just journalism at it's finest??? The latter. Someone must have cut and pasted something from their stories about the 5000s, or couldn't comprehend the press release (the latter more likely). The new 7000 series cars would replace the CTA’s oldest rail cars, including the approximately 400 2600 series, which were built between 1981 and 1987 by Budd Company. Additional, later-year options could allow for the timely replacement of the 256 cars in the 3200 series, which were built in 1992-93 by Morrison-Knudsen. In addition, the CTA could expand its rail fleet if ridership trends or system expansion warrants. CTA is currently adding the newest generation of cars, the 5000 series, manufactured by Bombardier, to its fleet. The CTA has added more than 290 of the cars, of a total planned 714 rail cars, on the Pink, Red and Green Lines (emphasis added). The 5000 series cars are replacing 2200 series cars manufactured by the Budd Company in 1969-70, 2400 series cars built by Boeing-Vertol between 1976 and 1978, and a portion of 2600 series cars built by Budd between 1981 and 1986. Of course, with CTA saying that the 7000s will be replacing the oldest cars in service, oldest maybe as of the late decade, but not now. So. unless NBC has some psychic insight about car shifts between lines, it was full of mortadella. Did I miss something? Why is NBC reporting the CTA is purchasing 846 #7000 series cars when a manufacturer hasn't been selected yet? The Blue and Brown lines are lucky if they total 500 cars together. Where would CTA house nearly 1600 cars? As far as the #5000 seats, I don't see why they couldn't cantilever those. The 846 was in the initial specifications. You might have an argument about "is purchasing," but unless this turns out like the 900 Olympic bus order, CTA is probably purchasing something. Again, go back to the Press Release, quoted above, which pretty much corresponds to the prebid meeting minutes addendum. As I mentioned then, the freaky thing was that the 714 were only supposed to replace approximately 540 cars (140 2200, 200 2400s and 200 2600s). 656 replace the cars cited in the Press Release, and then there are options for 190, supposedly for system expansion. 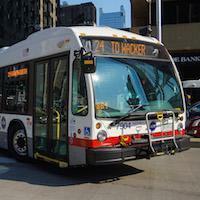 The Options are all set, but CTA needs the $$ to make these options a reality first. The only thing known definitely is that the Base Order will be paid for by Federal Money and CTA Bond Proceeds already in place when the IFB was issued. Options 1-8 will be built when future Federal and State Funding is available, as well as future Bond Proceeds when they become available. CTA can't estimate when the full $2 billion for this entire order will be available. If Huberman's presentation on the esthetics of the 5000s in Jan.2008 is based on anything similar to the specifications for the 7000s that the bidders submit 3 proposals, the two alternatives will basically be end caps. Stuff like the car dimensions are already set in the specifications. The reason given in the L books for why CTA went from the artic 5000s to the married pair 6000s was the articulation had to be disassembled to inspect the cars at other than the Met shops. While the shops have generally been rebuilt since then, one would have to establish that they could accommodate different kinds of cars. For instance, the Tribune video on having to inspect the welds on the 5000s said that the Pink Line cars were being inspected in the Lake Green Line shops. As a whole, the specifications require that the 7000s have to be compatible with the 5000s, so nothing freaky is going to occur here. I was trying to see if there were any remants of old driver paddles, when I stumbled onto an old "manual" for the first-gen 7000 Man Articulated series. Take a look. There are a bunch of photos (interior and exterior).